Keep up to date on the latest news and information posted to snackandbakery.com with our RSS feed. News and feature articles about tortilla chips, potato chips, and more. This annual award honors a leading baker for its ability to introduce a team of new baked products, all while staying on trend. Discover how tortilla producers are broadening their product portfolios. And get the latest from the Tortilla Industry Association (TIA) and an exclusive preview to its annual convention. These annual reports (June and July) include category product leader updates, category trends, consumer purchase trends and more. This annual award honors a leading snack manufacturer for its ability to launch a host of new snack items, all while staying on trend. Annual ranking of the Top 50 companies in the snack and bakery industries based on sales data. Explore how ingredient suppliers are revamping their portfolios to include healthy baking options. Discover how pizza and flatbread manufacturers are redefining how consumers slice it. Smaller than a regular meal, snacks are increasing in importance throughout the day. We look at all of the trends, news, issues and options. The snack and bakery market continues to unveil a plethora of sweet and savory products. Fats like butter, lard, margarine and shortening, and oils like canola, coconut, corn, cottonseed, nut, olive, palm, peanut and soybean, including monounsaturated, polyunsaturated and low-fat and reduced-fat formulation tactics and trends. Gums like agar, alginates, carrageenan, cellulose, guar, locust bean and xanthan, and native and modified starches like corn, potato, tapioca and wheat, to improve food quality, texture and stability. Ingredients like ascorbic acid, azodicarbonamide (ADA), emulsifiers, enzymes, gluten, glycerides, lecithin, oxidizing agents, reducing agents and others that improve the quality and handling of breads. Natural and chemical agents like baking powder, baking soda, bigas, mother dough, old dough, poolish, pre-ferments, sponges, starters, yeast and others used to ferment batters and doughs. Natural and synthetic ingredients like ascorbic acid, butylated hydroxyanisole (BHA) , butylated hydroxytoluene (BHT), tertiary butylhydroquinone (TBHQ), tocopherols and others that serve as antioxidants, antimicrobials, mold inhibitors and shelf-life extenders to improve food quality and safety. Kosher, sea, coarse, fine, finishing, flake and other salts to improve the functional quality of baked goods and act as seasoning agents, as well as salt substitutes, low-sodium tactics and trends. Trends, ingredients, products and formulation strategies for fiber-fortified foods using soluble and insoluble dietary fiber ingredients like cellulose, grains, inulin, psyllium, resistant starch and others. Omega-3s like alpha-linolenic acid (ALA), docosahexanoic acid (DHA) and eicosapentaenoic acid (EPA) derived from some cold-water fish, as well as nuts and seeds like chia, flax, hemp, walnuts, pecans, hazelnuts, among other sources. Nutritionally beneficial microorganisms found in fermented foods like yogurt, algae like spirulina and other ingredients for probiotic-fortified foods. Trends, ingredients, products and formulation strategies for protein-fortified foods using soy, whey, milk, isolates, concentrates, eggs, nuts, beans, lentils and gluten. Check out what products contain antioxidants. Chocolate and cocoa ingredients like chips, chunks, nibs, fillings, coatings and compound coatings. Dairy ingredients like butter, cheese, eggs, milk, whey and yogurt. Extruded and co-extruded ingredients like crisps made from soy, rice, beans and peas, as well as pellets for further processing. Artificial, natural and WONF flavors and flavor enhancers; artificial and natural colors, including FD&C colors and colors exempt from certification. Fresh, frozen, dried and other fruit ingredients, including whole, powder, infused and other ingredients. Refined flour and whole-grain amaranth, barley, buckwheat, corn, millet, oats, popcorn, quinoa, rice, rye, sorghum, teff, triticale and wheat. Chocolate, white chocolate, toffee, butterscotch and other chips, as well as fruit, nuts and other inclusions, to add value, color, flavor and texture. New ingredients like chocolate, cocoa, dairy, extruded bits and pieces, flavors, colors, fruit, fats, oils, gums, starches, dough conditioners, leavening, preservatives, salt, grains, inclusions, fiber, omega-3s, probiotics, protein, nuts, seeds and sweeteners. Whole, piece, flour and other nut and seed ingredients, including almonds, pecans, walnuts, pistachios, hazelnuts and other tree nuts; flax, hemp, chia, sesame and other seeds; peanuts; and nut substitutes or analogues. Natural & high-intensity sweeteners including sugar, brown sugar, honey, high-fructose corn syrup, maple syrup, stevia, erythritol, luo han guo, agave, molasses, malt, aspartame, acesulfame potassium & sucralose. Several ingredient companies have formulated solutions that deliver better quality products. Eliminating sodium is a key factor in maintaining a healthy diet. Discover the latest in low- or no-sodium solutions. Plant, bakery, supply chain, warehouse, distribution and other technology including logistics systems, computer hardware, computer software, human-machine interfaces (HMI), ingredient handling, batching, process control, traceability, recipe control, receiving & order fulfillment. Industry expert perspectives on handcrafted, handmade, artisanal, long fermentation, high hydration, open crumb, Old World, traditional, sourdough, craft, small batch and other subjects related to artisan bread and baking. Industry expert perspectives on grain nutrition, nutrients, vitamins, enriched flour, whole grain, ancient grains and other strategies for improving nutrition in grain-based snack and bakery products. Industry expert perspectives on developing snack and bakery products with clean, clear, simplified labels and ingredients, including preservative-free, using natural colors and flavors, non-GMO, natural, and organic. Chef perspectives on improving the culinary, flavor, texture and eating quality of snack and bakery products for retail, foodservice and restaurant markets. Snack and bakery industry insights, analysis and updates from Douglas J. Peckenpaugh, group editorial director of Snack Food & Wholesale Bakery. Industry expert perspectives on improving energy efficiency, reducing downtime, increasing throughput and streamlining operations at snack and bakery facilities. Industry expert advice and guidance on preventing food recalls, preventing allergen cross-contamination, preventing pathogens, developing HACCP plans, improving worker safety, meeting FDA regulations, passing FDA inspections and other measures to improve food safety at snack and bakery facilities. Industry expert perspectives on FDA guidance and other regulatory issues facing the snack and bakery industry. Industry expert perspectives and advice on improving the environmental sustainability of snack and bakery companies, including topics related to consumer perspectives on sustainability. Industry expert perspectives and strategies for improving workforce education, advancement and development at snack and bakery companies, including worker training and careers in snack and bakery production. Check out personnel changes within the snack and bakery industry. Learn about new advancements in ingredients for bakery and snack production. Advertorial content provided by snack and bakery ingredient, equipment, packaging, service and other providers. Plastic, modular, positive drive & other belts and conveyors for snack and bakery operations, including silicone, polyester, polyvinylchloride (PVC), thermoplastic polyurethane (TPU) & polyolefine (TPO). Operations control systems including logistics systems, computer hardware, computer software, weighers, checkweighers, human-machine interfaces (HMI), ingredient handling, batching, process control, traceability, recipe control, receiving & order fulfillment. Depositors, dividers and rounders for portioning, shaping, decorating, enrobing and more, including automatic and continuous systems. Extruder equipment and technology for single-screw extrusion, twin-screw extrusion and co-extrusion, including hot and cold processes. Fryer equipment and technology for frying snacks, including automated, continuous, vacuum, rotary and other systems. Dough laminator and sheeter equipment and technology, including inline, continuous folding, intermediate resting, flexible, artisanal and automatic. Mixers, including vertical, horizontal, spiral, planetary, batch, high-shear, continuous and inline. Ovens, including deck, single-pass, tray, tunnel, continuous, conveyor, impinger, rotating, rack, hearth, combination, hybrid, zone, gas-fired, convection, as well as equipment & technology for proofing dough. Packaging line equipment & technology, including depanning, cooling, form/fill/seal (FFS), laminated, pouch, glass, flexible, rigid, inspection, palletizers, robotics, scales, closing, tray handling & bagging. Equipment and technology for slicing, cutting and portioning, including automatic, band, ultrasonic, guillotine, dicers and slitter wheels. Warehouse & distribution logistics systems, computer hardware, computer software, stackers, loaders, pallets, secondary packaging, robotics, automation, fleet management, freezers & cold storage. Inspection and Detection equipment for the snack food and bakery industries. Trends, ingredients, products and operations related to artisan and artisanal products, including handmade techniques. Equipment, technology, ingredients, products, data, research & development & trends related to nutritionally improved, better-for-you products. The latest news and trends about the cannabis edibles market. Equipment, technology, ingredients, products, data, research and development and trends related to creating clean label ingredient statements, including natural, organic, non-GMO, no artificial colors, no artificial preservatives, allergen-free, easy to understand and simple. Ingredients, tactics, formulation and data related to flavor trends, including flavor pairing. Trends, regulatory, legislation, packaging, equipment and operational aspects related to food safety. Gluten-free trends, ingredients, products, sanitation and formulation strategies. Equipment, technology, ingredients and tactics to improve processing plant efficiency and throughput. Trends, ingredients, products, packaging and formulation strategies for controlled-calorie and portion-controlled foods. Agricultural, supply-chain, operational, packaging and other trends and initiatives related to environmental and business sustainability. News and trends about organic snack and bakery foods. News about Meat Snacks, including jerky. Trends, ingredients, products, packaging, equipment and formulation strategies for potato, tortilla and other chips, including potato crisps. Trends, ingredients, products, packaging, equipment and formulation strategies for fried, baked, popped and other crackers. Trends, ingredients, products, packaging, equipment and formulation strategies for frozen snacks and appetizers like fillo cups, taquitos, quiche bites, soft pretzels, breaded/battered foods and other products. Trends, ingredients, products, packaging, equipment and formulation strategies for snack mixes like mixed nuts and trail mixes that can include dried fruits, candy, chocolate and other ingredients. Trends, ingredients, products, packaging, equipment and formulation strategies for ready-to-eat (RTE) popcorn, microwave popcorn and other popcorn products. Trends, ingredients, products, packaging, equipment and formulation strategies for pretzels. Trends, ingredients, products, packaging, equipment and formulation strategies for baked, fried, extruded, co-extruded and/or expanded snacks, including puffs, rings, pillows, balls and other shapes. Trends, ingredients, products, packaging, equipment and formulation strategies for tortilla chips. Trends, ingredients, products, packaging, equipment and formulation strategies for packaged, fresh, frozen, refrigerated and in-store bakery (ISB) bagels. Trends, ingredients, products, packaging, equipment & formulation strategies for packaged, fresh, frozen, refrigerated &in-store bakery (ISB) buns and rolls, including refrigerated & frozen dough. Trends, ingredients, products, packaging, equipment & formulation strategies for packaged, fresh, frozen, refrigerated & in-store bakery (ISB) loaf breads, including frozen dough. Trends, ingredients, products, packaging, equipment & formulation strategies for packaged, fresh, frozen, refrigerated & in-store bakery (ISB) cheesecakes, including frozen crusts. Trends, ingredients, products, packaging, equipment and formulation strategies for packaged, fresh, frozen, refrigerated and in-store bakery (ISB) cakes. Trends, ingredients, products, packaging, equipment & formulation strategies for packaged, fresh, frozen, refrigerated & in-store bakery (ISB) pies, including frozen crusts. The latest breaking news related to all things tortilla. The latest trends and patterns about all things tortilla. Trends, ingredients, products, packaging, equipment and formulation strategies for french toast breakfast products. Trends, ingredients, products, packaging, equipment and formulation strategies for breakfast sandwich products. Trends, ingredients, products, packaging, equipment and formulation strategies for meal-replacement, nutritional, granola, snack and other bars. Trends, ingredients, products, packaging, equipment and formulation strategies for packaged, fresh, frozen and in-store bakery (ISB) cookies, including sandwich, bar and drop cookies. Trends, ingredients, products, packaging, equipment and formulation strategies for packaged, fresh, frozen, in-store bakery (ISB) and other muffins. Trends, ingredients, products, packaging, equipment and formulation strategies for snack cakes. Trends, ingredients, products, packaging, equipment and formulation strategies for sweet goods, including doughnuts, Danish, sweet rolls, cinnamon rolls and coffee cake. Our monthly case history focus on exciting companies in our industries. New ingredient developments, issues, trends and details from top industry ingredient providers. Read how-tos on various topics pertaining to the snack and bakery industry. Practical examples of supply-chain success stories related to improving snack and bakery businesses, including those related to ingredients, equipment, packaging, processes, technology and logistics. Showcases the latest in equipment and ingredients available to bakers and snack producers. 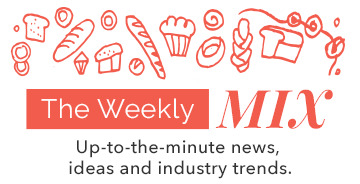 Company announcements, emerging bakery and snack food product introductions, trends, regulatory issues and more. Monthly production facility coverage that focuses on exciting companies in our industries. New information is provided regularly by suppliers, associations, equipment manufacturers, authors. New packaging materials including pouches, flexible, laminated, glass, rigid, canisters, bags and more, including sustainable, resealable, convenience and closures. Stay up to date with the newest snack and bakery products on the market.